Providence, RI (5/30/2014): Sometimes history repeats itself in nice ways. That’s what the R. I. Reds Heritage Society has planned for its 14th annual reunion at Goddard State Park on Sunday, August 3. First: Alton White, the first and only black player ever to wear a Reds uniform in the team’s fabled 51-year history (1926-1977), will lead a host of ex-Roosters and other former pro greats in celebrating the event. Second: The Society will retire the number 14 jersey of the late Chuck Scherza, the legendary center who was a highly popular mainstay with Reds during his 10 seasons in Providence starting in 1945. That ceremony will be first of its kind ever in Reds’ history. White and his wife Linda will make their first visit back to Rhode Island since his outstanding three-year tenure here that began in 1970. Scouted and placed on the Reds’ reserve list by Buster Clegg, president of the Society today and team general manager in the late 1960s, White became an instant favorite of fans, with his skating and scoring skills. 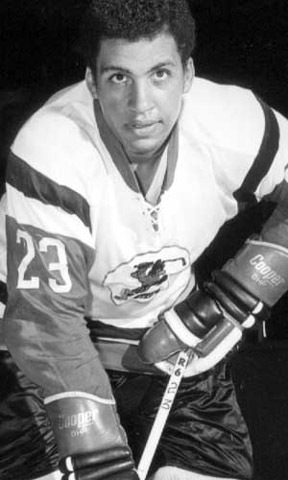 Attesting to Leduc’s evaluation of his linemate’s record with the Reds: White scored 24 goals in his rookie year (1970-71), followed by 29 and 30 goals – a total of 83 in three seasons before moving the World Hockey Association where he became the first black player to score in the three-goal “hat trick” in a major league hockey (NHL or WHA). In retiring Scherza’s number 14, the Society will honor one of the Reds most popular players ever. He was a dynamite player who during WWII played center as a youngster with both the N. Y. Rangers and Boston Bruins. He joined the Reds in 1945-46 then helped the team finish first in the Eastern Division of the American Hockey League in 1947-48. In ‘48-49 Chuck’s leadership added not only a repeat of the season before but a coveted Calder Cup championship. He was rated as one of the toughest competitors in the league, never ready to look for trouble, but when trouble came his way, look out! After a 10-year career with the Reds, an injury later while as player-coach of a senior team in Canada cost him his left eye and caused his retirement from active play. But that did not keep him away from hockey. He became a respected linesman in the AHL and referee in college, high school and youth hockey. Unfortunately, Chuck, a longtime resident of Rhode Island, passed away this past March 16 at the age of 91. August 3 will celebrate the 14th annual reunion for the 700-member R. I. Reds Heritage Society. Tickets are $35 for adults, $15 for children ages 6-15; and no charge for kids under age 6. 100 tickets have already been sold. Only 200 of the 300 capacity remain. Reservation deadline is July 15. Alton White will lead a host of ex-Roosters and other former pro greats in celebrating the event.